The challenge laid down by golfer Greg Norman at last year’s British Open - who aged 53, led the tournament after fifty four holes - has not only been continued, but is growing into a defining trend for 2009. The "old-timers" can no longer be seen as anything other than true contenders it seems, as a raft of returning champions have proved. Schumacher has shocked the world of sport with his return to Formula One at the age of 40. If Norman had led impressively before fading, the achievement was put into the shade by 59-year-old American Tom Watson at this year’s event. Watson had one hand clasped firmly around that famous old Claret Jug, such were his heroics at the event. He would have won it too had he given his putt at 18 a chance but as he later conceded, the pressure and sheer emotion involved affected his stroke at a time when he needed it most and Stewart Cink would go on to prevail. Watson’s efforts at Turnberry defied the odds but what stuck in the memory were his comments all the way through the tournament- that he felt he had the game to win. That is it in a nutshell. The inner self-belief is still there. No doubts at all in his mind he could win at just shy of his 60 birthday. Watson already has eight majors including five Claret Jug titles - why not try and win another? As the legendary Jack Nicklaus told his compatriot- “just get out there and win one for the old folks!” He must have been desperate to prove to himself he could still do it and that age should be no barrier and he came so close to doing just that. The rejuvenation of older stars like Watson is a joy to behold and it's not just in golf that those of retirement age are still up there with the best. At 37, Lance Armstrong appears to still have a strong desire to not just compete but to win too. His post Tour de France spat with this year’s winner Alberto Contandor had everyone licking their lips in anticipation of next year. Like Watson, Armstrong still clearly believes he’s good enough to be the best again. I can just imagine him surveying the rest of the field during his “retirement” and thinking there was still plenty of room for him at cycling’s toughest annual challenge. Just the fact he’s going to be back in 2010 confirms that view in my book. At the ripe old age of 40, Michael Schumacher’s return to the top of Formula One is probably for me at least the most surprising. Yes, the Felipe Massa injuries have played a part, but did anyone at Ferrari have to force his hand? Schumacher's been champing at the bit to get back into that cockpit. Once it’s in your blood, it’s in your blood and don’t rule one the ferociously competitive German triumphing again before the end of the current season. Even Massa doesn’t want Schumey to get too comfortable in his seat after jokingly telling him he’ll be back in no time! 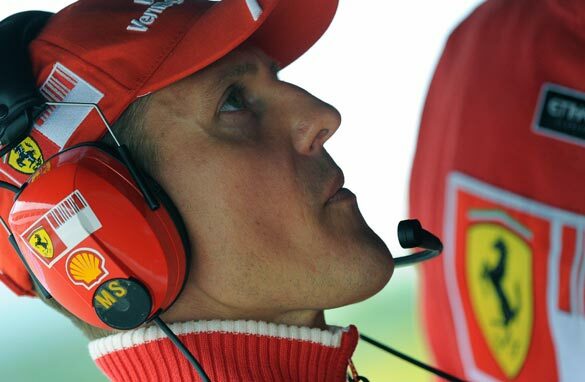 Whatever Schumacher’s performances are like in the coming weeks, one thing is very clear …. He very much like the other “old timers” wouldn’t still be competing if he didn’t believe he could win. Merely making up the numbers simply isn’t his style.